A repost from September 11, 2012 that I looked back on today. I know where I was. I’ll never forget. I shared these memories today with my cherubs and my niece. My conversation with the group of 10 year olds quickly turned to looks of shock and horror. Only two of them were even alive. One was one day old and the other was a little over a month old. I tried to help the rest of them understand the impact those events had on everyone, including myself, that day. My niece said, “What those men did was not nice and just rude. They made a bad choice.” That sweet little six year old couldn’t have said it better. I told them this story. My story….. I was a 17 year old senior in Mr. Adam’s government class in the southeast side of MVHS. He received a phone call and quickly turned in the TV to CNN. 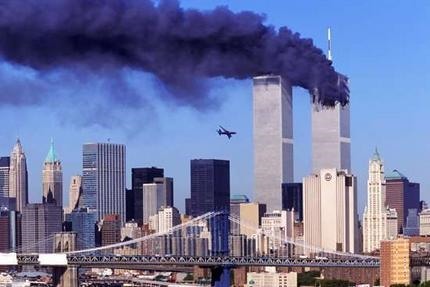 Shortly after that we watched the second plane hit the twin towers. There was silence. A room full of arrogant and invincible seniors immediately became hushed with silence. Everyone knew the world just changed forever. Boy, did it ever. One of my best friends Jen was in that class. I can’t even remember the conversations between all of us. Sometimes I wonder if we even had conversations or if we just sat there in shock and awe of what we were witnessing on the TV. Then an announcement came on for the entire school to tell of the events that just occurred. They asked the teachers to leave the TV’s off. There could have easily been a riot after that announcement. We wanted to see what was happening. We needed to know what was going on. Immediately we went on a lock down. No one in and no one out. More planes were crashing, so who really knew if our little town would be next? It wasn’t impossible, unfortunately. Thank the Lord that never happened. The next period I went to the office to serve as office assistant and Madelon let me call my mom immediately. She was crying. Saddened by what she was watching but happy to hear my voice. She had talked to my brother and my sister and everyone was okay. I wanted her to come get me. They wouldn’t let her. Can you imagine not being able to pick up your own child? That’s when we all knew this world we lived in would never be normal again. You’d have to have your ID checked to get into your child’s school. You’d have to have your body patted down to fly on a plane. All because some idiots decided killing 3,000 people would get us back for whatever we had done to them. I was worried my brother would have to go to war. Would they do a draft? It was on everyone’s mind. One thing was for sure. You crash into our country and we’re going to fight back. So who was to say they wouldn’t do a draft and my brother wouldn’t have to go fight? I thank ALL of the military men and women who stepped up and volunteered to continue fighting for our freedom. So after sharing this story with my cherubs and my niece I pondered on their innocence of these events. It’s unfortunate that my students know what a “lock down” drill is and why we have to do it. Isn’t that sad? It’s heartbreaking that my niece knows that four planes flew into places and killed 3,000 people. Isn’t that sad? It’s sickening to know the world that my sweet littles have to live in is so much different than the world I grew up in. I use to be able to ride my bike whereever I wanted and whenever. Now we have to worry about creeps stealing kids. Everyone is on edge. Everyone is overprotective. It’s no longer human nature to just TRUST someone. It comes down to this. We were attacked and we fought back. When you get defensive you put up a guard and a shield. 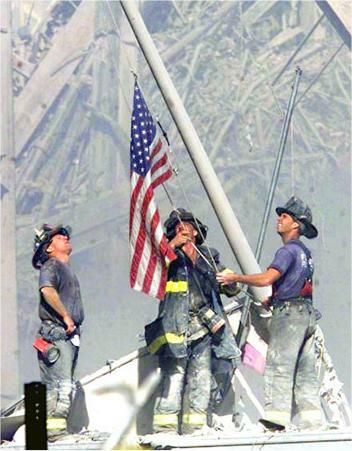 Since September 11, 2001, we as Americans have not been able to put that guard and shield completely down. Will we ever be able to? We hear about a man killing men and women at a temple and in the back of my mind I’m always wondering….couldn’t that have happened to me? Couldn’t that have happened here? I want my trust back in this world. I want my life to feel at ease. I want my littles and all the cherubs to live in a world where we trust and love and the word “terrorist” doesn’t even exist. After this long day of constantly pondering about where I was 11 years ago those are the things that I couldn’t wish more for. One of the many pictures that brings tears to my eyes. I am thankful for the men and women in our military who fought or are still fighting. I’m thankful for the police officers and firefighters and any public safety members who risk their lives to save others when the bad guys try and take over. I’m heavy hearted tonight, but thankful.